The United Nations has gone too far. They are now colluding with European leaders to save the Iran nuclear deal. Even though President Trump has withdrawn the United States from the agreement, the UN is using YOUR TAX DOLLARS to keep the deal alive. After Trump made his announcement, Iran's legislators literally stood on the floor of the country's parliament and chanted "Death to America" while burning American flags. 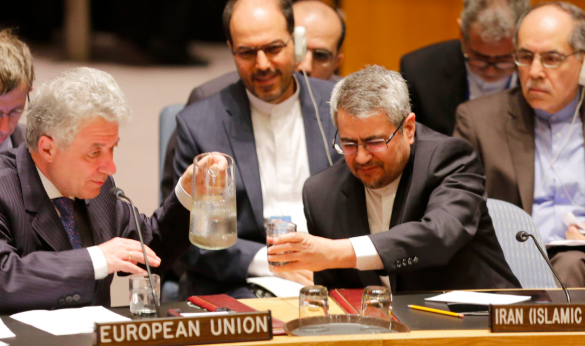 Iran's government has promised to restart their nuclear weapons program. Congress never ratified the Iran nuclear deal. Obama chose to go through the United Nations and pass it as an international agreement. Just like we saw with the Climate Treaty, the UN is now trying to make it permanent. And as I said, they are using America's funding to do it. Ted Cruz has filed the legislation to end this once and for all. He has Democrats on board as well. But Ted needs your help to force the Congressional leadership to bring the bill to the floor! Please, join the fight using our system below to DEMAND that Congress pull the plug on the United Nations once and for all! President Trump withdrew from the Iran Nuclear Deal. He did so after Israeli spies captured evidence that Iran was secretly preserving its nuclear research so they could restart the weapons program at a moment's notice. Under the deal that Obama signed (without Congressional approval), Iran would be legally able to start building a nuclear weapon again in just a few short years. The Israeli operation proved that was exactly what they were planning on doing. So, Trump withdrew from the agreement. Now, however, the United Nations is trying to save Obama's signature foreign policy "accomplishment." They are using my tax dollars -- just so we're clear, MY tax dollars -- to undermine American foreign policy. For the past year, UN bureaucrats have worked tirelessly to undermine American sovereignty. They have been helping illegal aliens and middle eastern refugees apply for asylum in the US under technicalities and they have been working with liberal mayors and governors to save Obama's climate deal. But now, this is different. We now know for a FACT that Iran was preparing to restart their nuclear program the minute Obama's weak agreement allowed them to. The Iranian government even just admitted that is their plan. And the United Nations is working to help make a nuclear arms race in the Middle East a reality. You must shut this down. This year, the Omnibus Bill contained an amendment allowing for Congress to defund any UN agency or program that undermines America's interests. You MUST exercise this authority. The United Nations cannot be allowed to use American funding to prop up this failed agreement. Shut it down NOW or else pack your bags.